For the children and grand children of Patricia Bright Blumberg and dedicated also to my friends Lee Hirsch and Cynthia Lowen. 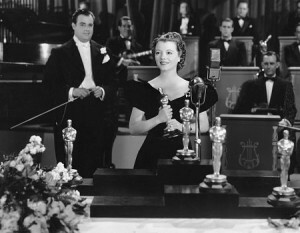 The Oscar, won in 1939…it’s now stored away in a vault. That was what my husband, Eric Blumberg said after the passing of his beloved mother, Patricia Bright Blumberg, in 2009, at the age of 87. His brother and sister in law were tasked with dividing up Patricia’s things, and Eric told them that he just wanted the statue. He had told me about it, but he wasn’t clear on the story. He knew that she had entered an essay contest in her teens for film criticism and her prize was… an Oscar. When it showed up one day, I was surprised at how heavy it was. Just to satisfy my curiosity, I weighed it. It was a little over 8 pounds. According to the Academy, an Oscar weighs 8.5 pounds. I measured it for height and instead of the 13.5 inches of today’s Oscars, it was 12 inches. 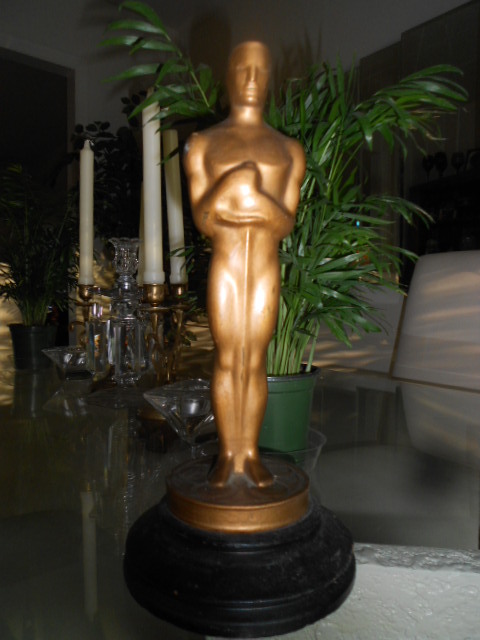 I researched this a bit more and discovered that older Oscars were indeed 12 inches. I did some more digging and found the image below. There they were, and it seems, I had one of those little golden boys in my hands. Eric’s later research revealed that is was indeed made by the same company who made the Oscars you see handed out every year. So, what about the woman who had the golden boy for so many years, I wondered? She wasn’t famous as we might know it, though she was known. She’s still on the IMDB, for various stints on Broadway, or on television from the late 1940’s through the 70’s, but there’s not much else out there on her. You have to dig. She was however, a skilled, polished, and hard working professional, who loved what she did, from what I hear and what I read. I am new to the family, and have heard only pieces of her story. I watched a clip of her once on the iconic 50’s series “Car 54, Where Are You?”. 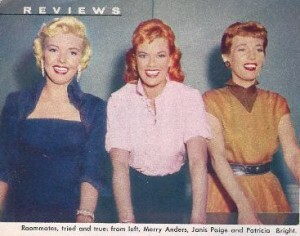 I also found a clip of Patricia, Kaye Ballard, and Bette Davis in 1966 on “To Tell The Truth”. She and Ballard, a friend, obviously were the impostors, a skill she had been honing for years, and Bette thought she was dead on. That’s most of what I knew. A box of press clippings, head shots, playbills, and reviews told me more. She was born Pearl Breit in 1922, on the Lower East Side of New York City, the oldest child and only daughter of Samuel and Lillian Breit. Samuel, born Simon Bright in London, and Lillian Mandelwitz Breit, ran a stationery store on Whitehall Street. Her son Eric was never told that her name was Pearl, and he thought her birth happened in 1925. “Mom gave herself three years”, he says, and a new name as well, or at least her father’s original name. Her interest in performing apparently took hold early in her life. In her sophomore year at Hunter College, she was hired for her first acting job on radio. 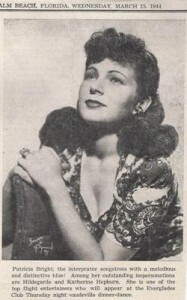 An audition for the John Golden Awards, which she won, while still in college, had her satirizing the judges and in her words, “they seemed to enjoy it”. Patricia, left, entertaining World War Two troops, early 40’s. Early supper club days, at 22, already noted for her Hepburn. Her specialty was indeed “mimicry”, as Walter Winchell put it in a column from 1946. In the same year, Earl Wilson called her “one of bright new acts of Cafe Society Uptown“. 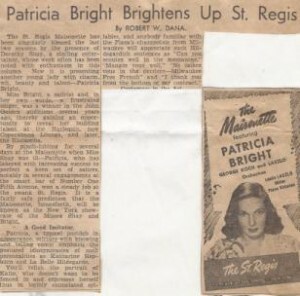 By then, she had become Patricia Bright, and had worked her way into a steady job at the swank St. Regis, by what Robert Dana called “her charm, beauty, wit, and talent“. She had re-invented herself into what Dana called “a typical post deb in appearance”, but with a twist. 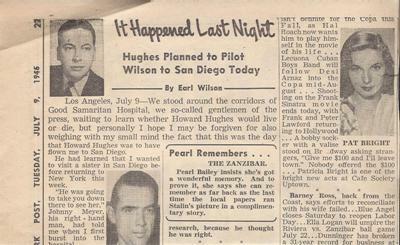 As she put it in a New York Post feature story in 1944 when she was just 22, “ I do biting satire, and expect to be found dead with four daggers in my back any day now”. She was, in short, a funny lady with some distinctive voices. Katherine Hepburn, according to Dana, seemed to be one of her best. She studied her well at the Schubert, it would seem. Steady job, 1946, she did the cut and paste herself here. When Patricia’s box of memories arrived at our door, they were carefully separated..Head shots, playbills, press clippings, television reviews, voice over…and there were others, marked for Eric, by her, of his press clippings from his radio days. But there was more, not as carefully sorted but bulging full of…her family. At 22, she did what young ladies did in those days, she married a young William Morris talent agent named Stephen Blumberg, the son of a Russian immigrant mother and a father who was an executive at Brooks Costumes. 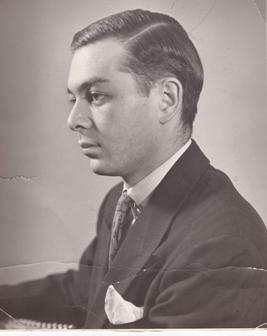 Stephen later followed his father in the business. Steven Blumberg, my late father in law. 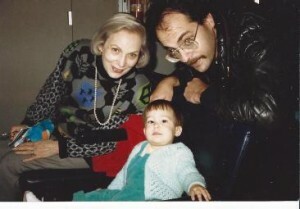 At 25, she became the mother of Robert Blumberg, born in 1947, Eric Blumberg, 1952, and daughter Amy, born in 1957. She didn’t stop working. 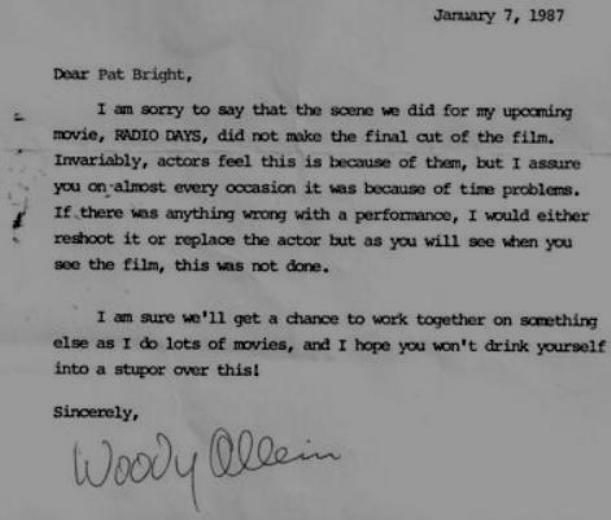 The late 4o’s brought some obscure early TV work in shows like “Draw Me a Laugh” and “The Borden Show”, prior to her first Broadway show, “Tickets Please”, which brought Ed Sullivan,Colgate Comedy Hour, Jack Paar, and the Red Buttons show… appearances as “herself”. 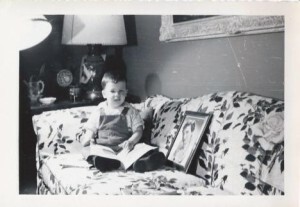 “Herself” again, late 50’s, now mother of three. My favorite. 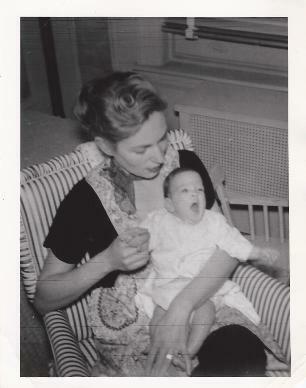 “Herself” in photograph, early 50’s to comfort little Eric. She still played the Versailles, the Cotillion Room, the Maisonette, and Bon Soir. With television, clubs,and Broadway, and three kids, I think she earned the title “working actress”. In those days, juggling both was rare, but juggle she did, and most likely with aplomb. She had help, she wasn’t a super woman. Eric remembers housekeepers. He also remembered her cooking dinner and then leaving for work. 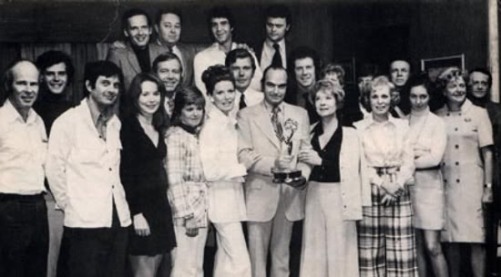 There was a brief stint in Hollywood, on a short lived series called “It’s Always Jan” with Janis Paige. From what I can tell, there’s Janis Paige, a Marilyn Monroe clone, and Patricia, who undoubtedly played the wisecracking friend. I would guess that became more and more common as she grew older. She was lovely, but like Lucille Ball, you heard the funny before you saw the looks. They were cast as “single girls”, but Patricia had her two children with her in a rented house. Eric remembers the stories of those studio days, and rubbing up against the greats, as she did though she never became a movie actress. She was still a fan, still loved the stars, and according to her family, never missed an Oscar broadcast, and watched it yearly, champagne and all. I find it comforting that she still had something some of those greats never had, that golden thing, even if it wasn’t for the usual things, even if it wasn’t made for her. It was still heavy and solid and must have been a great conversation starter for new guests. 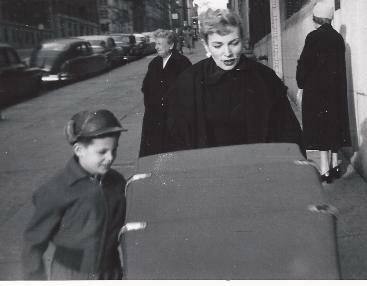 The show didn’t last longer than a season, and they were back in New York, her third child to follow. The Oscar may have gone with her, but returned to it’s place on the family mantle. Eric confirms the “Oscar” as doorstop story. She soldiered on. Patricia returned to Broadway in 1961 in James Thurber’s “A Thurber Carnival”, directed by Burgess Meredith, with Thurber playing himself. I wish I had heard that story from her. 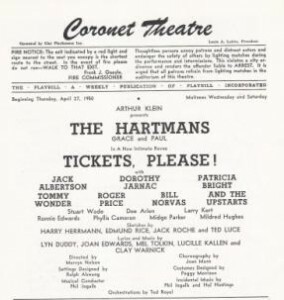 Her playbills show her still headlining at the Cotillion Room at the Pierre, but she also had a stint on what Leonard Maltin calls “one of the funniest TV shows of all time”. I was a bit young to remember the iconic early 1960’s series “Car 54, Where Are You?” headlined by Fred Gwynne, Al Lewis and Paul Reed. My husband, a fan, asked me to watch a few episodes one night, particularly one he calls “some of the best comedy ever done on TV”, called “I Hate Captain Block”. Almost vaudevillian, it was hilarious. Patricia, who had a few episodes from ’62-’63 was a blip on the screen, playing Captain Block’s wife Claire, but she has a presence, even in that bit. I notice as she moves into her fifties, she’s now billed as Pat Bright. In 1972-73, she showed up on “The Edge of Night”, as “Edith Berman”, the dead wife of one of the leading characters. Eric said, “She played a ghost”. 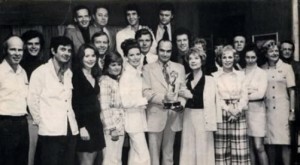 Edge of Night cast photo, Pat in plaid, the ghost. Here’s one –Like any sensible woman of her day, my mother was enamored by Paul Newman. When she finally got her chance to meet him, he came up to her to greet her and announced (to this day, no one knows why he felt it necessary): Hello, I’m Paul Newman. All my starstruck mother could do when gazing into his light, blue eyes was say: Goddamn right you are. This caused him to crack up and give her an unforgettable hug, and from then on you knew they would be buds. Although I must admit, I don’t believe they ever met again. Bette Davis Part One- I have no idea what year this would have been. I hope she didn’t either..
As Eric stated above, Pat was first and foremost, a wife and mother. I hope she could compartmentalize the pieces of her life. It couldn’t have been easy. She held the family together as her husband Stephen’s health declined. He died at 59 from a congenital heart condition. She never remarried. I get the sense of someone pretty joyful, until the last rough days of her illness and death. She held onto her home at the elegant landmark Apthorp until the end, as she held onto her family, including the two who followed her into the business, Eric and Niki. She also held onto the pieces, some crumbling now, of her fascinating life. In the 1980’s, with Eric, then in radio, and baby grand daughter Niki, now in her twenties and in theater in Los Angeles. And the Oscar? Strangely, I might have attended the Oscars this year, but that was not to be. Instead, I’m getting her prop “Golden Boy” out of its vault for the night, and will watch it like everyone else, and like her, will have champagne in hand. And I’ll celebrate, along with her son, and with her spirit, I hope, what a winner she was. How interesting! Look forward to reading the rest of the story. What an interesting childhood Eric must have had. I’m enjoying looking through all her clippings and telling her life events. There are things even Eric didn’t know! Bravo! What a wonderful story. Isn’t she a great character? I love that story too. Remind me to use if if I ever meet George Clooney! 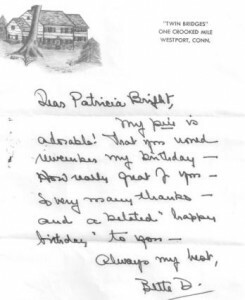 Thank you for posting this lovely retrospective on actress Patricia Bright. 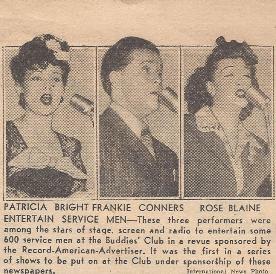 I am a great fan of old radio shows and on January 12, 1941 she appeared on one called “Behind the Mike” where as a young up-and-coming actress she “auditioned” for two well-knowned talent scouts. She presented a dramatic monologue and then did a very funny bit using different accents – Cockney, Scottish, Russian, etc. Not surprisingly, the talent scouts praised her performance and said they would have no problem submitting her for work. I always wondered what happened to her. She was so talented. 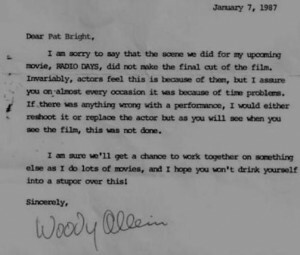 But, as you note, there is little beyond the IMDb listing (and a couple of old photos being auctioned this week on ebay). I would love to have seen her impersonation of Hepburn. It must have been priceless. I’ve emailed you in response to your lovely comments about Patricia. Thank you so much, my husband will love reading them! I am so happy to have found this article! 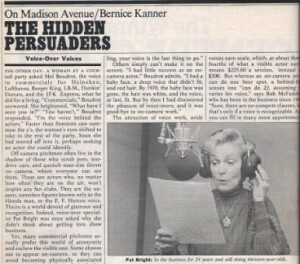 I took voice lessons with Pat in her Apthorp apartment years ago and often wondered what had happened to her. Thank you for writing Danielle. I wish I would have known her!